Mi flash tool latest version 7.4.25 and previous version 6.8.30 free download for windows operating system. This latest version of Mi flash tool setup 2018 is recently released with new and unique features. This Mi flash tool is developed by Xiaomi to flash stock firmware, fast boot files on the Xiaomi mobile phones and tablets. With the help of this flash tool, you can easily flash Xiamoi Android smartphone and tablets devices that use Qualcomm Snapdragon processor. you can easily update MIUI or custom Rom using this mobile tool. This tool also allows you to flash multiple devices at once. 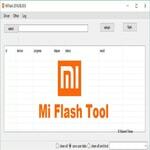 If you have an older version of Mi flash tool 2015 installed you will need first to uninstall and install latest version mi flash tool from windows to flash mobile phones and tablets. MiFlash not supporting devices older than Mi3. Mi Flash is supporting only Qualcomm devices. The Xiaomi Mi Flash tool works on almost all Xiaomi Mi devices. So you did not need to download different tools or software’s to flash Xiamoi phones. Rather than users to find out the correct USB drivers, the Xiaomi Mi Flash tool installs with latest official drivers which work on all Xiaomi phones and tablets. The Mi Flash tool allows users to flash one device at a time rather it allows for flashing users to flash of several devices at once. You can configure more than one device and then start updating them. The installation of Mi Flash tool is simple and easy as you would only need to run the installer wizard once and it would set up all the files for you. If your mobile firmware doesn’t require you to flash all partitions, the Mi Flash tool supports three flashing options. One flash all, second flash all except storage and third flash all except data and storage. So you can easily choose to flash options for your mobile phone. First, you uninstall the old Miflash tool from your PC system. Double click the MiflashSetup to start the installation. The first screen clicks Next. Now choose where to install the Miflash. You can leave it by default and click Next. Confirm the installation and let it start by clicking Next. The final screen clicks on Close. You are ready for Flashing mobile phone. Mi Flash Tool supports any version of MIUI Fastboot ROMs for any Xiaomi phone models. This latest tool fixes your Xiaomi Mi or Redmi phone. This mobile tool allows you to completely reset your phone. it also upgrades your phone’s ROM cleanly. So you may need this tool installed on your laptop or computer. If you wish to download the latest version of Mi flash tool, then click the given link for free download. This latest tool supports all windows like XP,7,8, 10, Vista and other versions.